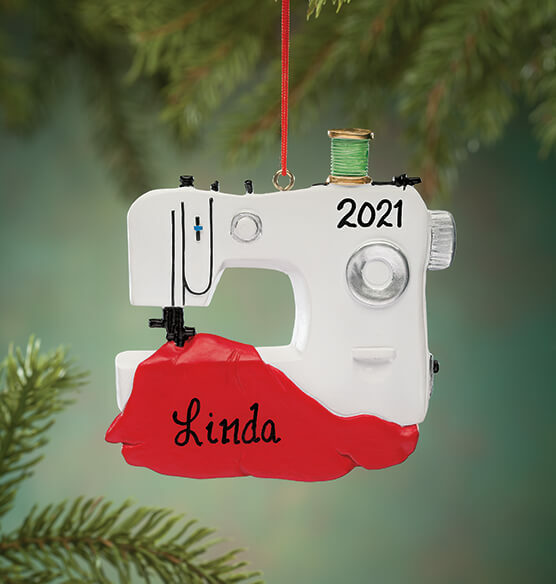 The seamstress on your gift list will love this personalized sewing machine ornament for SEW many reasons. Capturing the artful appliance in brilliant detail, our sewing machine personalized Christmas ornament celebrates mechanical magic—and the love sewn into each stitch. We’ll personalize for a darn sweet gift! Specify name; limit 1 line, 8 letters/spaces. Specify year; limit 4 characters. Resin. 3 1/2" long x 3 1/2" high. This ornament is beautiful. My Mom's name and year were engraved on it and was really done well. Our son is a costume designer as well as teaching sewing in a Magnet School so looking for the right ornament each year is challenging thought this would be a great one since it couple be personalized. Very nice ornament, larger than I thought it would be, which is great! The person who received it as a gift loved it! Just give yourself more time to have it shipped to you! I buy different Christmas ornaments for my grandchildren every year. I always return to Miles Kimball for these ornaments. They are great quality and have a huge selection to pick from and are larger then they appear online. This specific one is for our oldest granddaughter who is 9 and she loves to sew!. This was a great ornament for a friend that sews a lot - personalized and attractive. Until I can glue it together, I will not be using it. After, I will hang it on the wall near my sewing machine. I bought this as a stocking stuffer & it was pretty cheesy looking. My quilting group will love it..
My mom just started sewing! My granddaughter has recently become very interested in sewing. I got her a beginner sewing machine for her birthday..
My wife sews a lot and I liked being able to personalize it. the details, especially the flowing material. it's really nice.